And the firm will receive an extra $30bn from the US government as part of a revamped rescue package. AIG has already received $150bn in financial support - the biggest bail-out by far of any US company. Stock markets slid sharply as AIG's plight underscored fears about the health of the global financial system. The Federal Reserve and the Treasury said that AIG posed a "systemic risk" to the global financial system. "The potential cost to the economy and the taxpayer of government inaction would be extremely high," they said. "The additional resources will help stabilise the company, and in doing so help to stabilise the financial system." As well as insuring households, AIG plays a key role in insuring risk for financial institutions around the world. The news of AIG's historic loss comes as HSBC, Europe's biggest bank, seeks to raise £12.5bn ($17.7bn) to strengthen its finances following a 62% fall in annual profit. The revamped rescue package also involves a restructuring of AIG's operations. It calls for the Federal Reserve to take stakes in two of AIG's international units in exchange for reducing AIG's debt. The new measures will also effectively cut the interest payments the insurer must pay to the Federal Reserve. The AIG financial support is about three times greater than that given to Citigroup, which has received $50bn, and Bank of America, which has received $45bn. 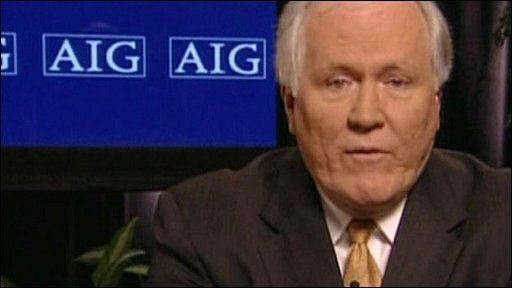 AIG chief executive, Ed Liddy told the BBC that the loss, while hefty, could be explained. "Asset values on a worldwide basis are going down. When we record those declines, they go through our P&L [profit and loss account] - that's about half of our loss," he said. "Second, when you're going through a restructuring of a company, it calls into question things like good-will and deferred tax assets... We've written down the value of some of those. That's primarily what constitutes that $62bn. "If you look past that - admittedly that's a big ask - the basic insurance operations of AIG remain rock solid." US officials fear that a failure of AIG would be disastrous for both the US and the global economy. Credit rating agencies, such as Moody's, Fitch and Standard & Poor's, had been poised to cut AIG's credit ratings as a result of the record loss. That could have forced AIG to default on its debt, which would have had a knock-on effect on all of AIG's businesses. AIG provides insurance protection to individuals, small firms, municipalities, personal pension plans and major US listed companies. It also insures major financial institutions against complex deals going wrong through derivative contracts such as credit default swaps - the main cause of its problems. Corporations have failed to build value into their firms, taxpayers shouldn't be paying for bad paper. The company first received financial assistance from the state in September in the wake of Lehman Brother's collapse. In the UK, AIG is best known as a sponsor of Manchester United, but the deal is due to come to an end. It also underwrites insurance sold by a number of High Street names including Boots and Argos.